Huge Savings Item! Save 17% on the Super Wings - Robo Rig | Toy Vehicle Set |, Includes Transform-a-Bot Jett Figure | 2'' Scale by Super Wings - at Baby Stroller Car Seat Combo. MPN: US720311. Hurry! Limited time offer. Offer valid only while supplies last. ''I’m Dizzy and I’m rescue ready!'' On the hit preschool Super Wings show Dizzy, a pink rescue helicopter, is always ready to save the day. Time for a super upgrade! 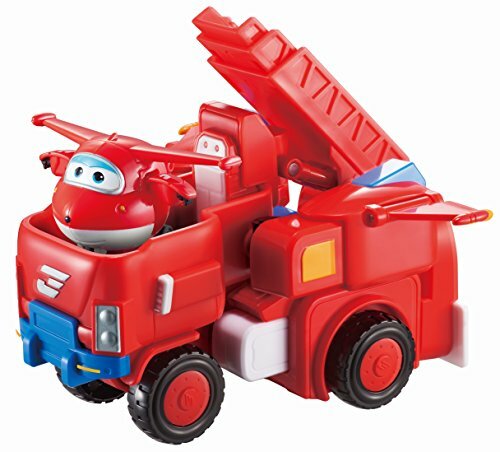 This set includes two transforming vehicles: Jett's Robo Rig as seen in the hit preschool Super Wings show and 2" scale transforming Jett figure. Jett is confident, positive, full of curiosity and never hesitates to try new things. He gets along with everyone at World Airport and he loves to travel and deliver packages to kids around the world. Jett's Robo Rig - Easily transforms from nearly 7" tall Super Robot Suit to Robo Rig with extending ladder and real working wheels. 2" scale transforming Jett figure - Transforms from vehicle to bot in 3 easy steps, has real working wheels and easily fits in the cab of the Robo Rig. Jett's Robo Rig and 2" transforming Jett figure are for preschool Super Wings fans ages 3+. "Jett is young, confident, and really fast! Join Jett and his loveable transforming friends, the Super Wings, as they travel the globe to deliver packages, solve problems and help boys and girls around the world in the hit preschool show. Every delivery is a unique adventure filled with new cultures, languages and new friends! Includes one Jett Robo Rig toy and one 2" transforming scale Jett toy.